Turntables are the foundation and building block of DJing. Before making your selection, have a clear idea about your intended use of the turntables. The following basic types of DJ turntables exist: classic analogue (with a direct/belt drive) and USB turntables. The advantage of USB turntables is that they can be used to digitise records (as audio files for your PC). If you are a beginner and need additional information, you can call us at 020 8089 1481 (Mon-Fri, 9 a.m. - 5 p.m.) or write to us at . We'll be happy to answer all of your questions. When you start to look into DJ turntables, you learn that there are two basic types of analogue turntables: belt-drive and direct drive. Belt-driven turntables are cheaper than those with a direct drive. In exchange for the higher price, turntables with a direct drive have a more stable rotation speed. All DJ turntables have a 'pitch fader' that allows you to control the rotation speed. Our offer also includes a USB turntable category. If you want to scratch or mix songs from the PC over turntables (using the popular DJ programs Serato, Traktor etc. ), this is not where USB turntables excel. You can connect any DJ turntable to a PC. You will only need a DJ mixing console with a USB interface and a special timecode record. After the turntable is connected to the mixing console and the PC with the DJ program, this record acts as if it holds the song you assign from the computer. For understanding and learning the basics of DJing, a less expensive turntable with a belt drive will suffice. But if you don't want to make any compromises and want to have the same equipment that experienced DJs have, get yourself a turntable with a direct drive. 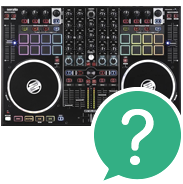 When timecode records, DJ programs and the right mixing console are used, both types of turntables can be connected to the PC. If you have rare LPs at home that you would like to digitise or if you plan to electronically use samples of certain songs on vinyl, a USB turntable will certainly come in handy. Additional criteria for choosing the right turntable. Arm: there are straight- and curved-arm models, though this is not that critical at the beginning. It is mostly a matter of ergonomics, which is important for more advanced DJs. Possibility to control rotations (pitch): this is a basic and essential quality of all DJ turntables. The ability to control the speed makes it possible to match the beat from two turntables, which is a basic DJ technique. 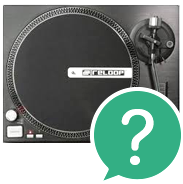 Design: this is not a major concern in your selection, as it does not improve the performance of the turntable. Still, it serves its purpose for those interested in both function and aesthetics. Cartridges and needles are also important for the transmission of music. It's always a good idea to have a back-up needle on hand should one get damaged while scratching. This can happen with DJ turntables – needles are essentially replacement parts that wear down over time (although they're not changed nearly as often). Cartridges differ by their use, quality and price; the most commonly used type is MM (moving magnet). Needles are divided by their shape into spherical (rounded) and elliptical (with a sharper point). Full-fledged DJ equipment also includes a mixing console. A DJ table to comfortably hold your gear is also useful. You can also buy timecode records and various soft and hard cases Back-up cartridges and needles will also come in handy. Good luck mixing and mashing!